I've had to replace two treadle joints this weekend, and thought that it might be a good opportunity to write about the subject with photos, because sometimes people seem unsure about which type to order. 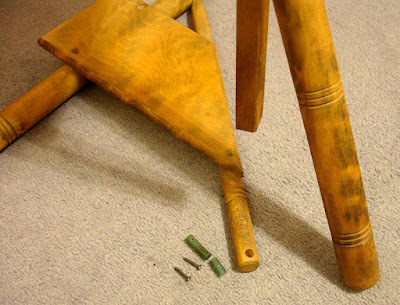 The treadle joint on my Haldane has broken this weekend. 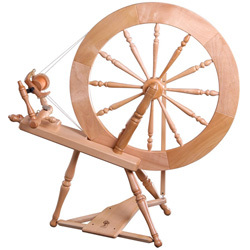 (Why does it always happen when you eagerly sit down to start spinning?? I suppose the lesson is to always keep a spare one handy.) It's sometimes called a con-rod joint. 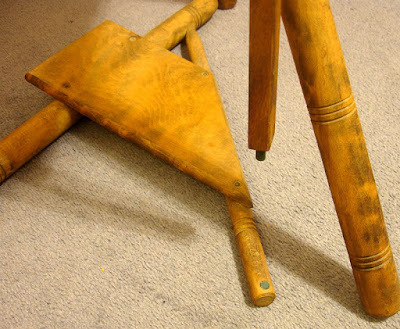 the con-rod (connecting rod) is the long piece of wood joining the treadle to the crank. 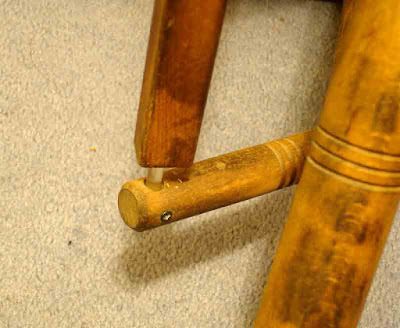 Both the treadle and the con-rod have round holes to take this round, flexible type of joint. Thin screws go through the joint and hold it in place. 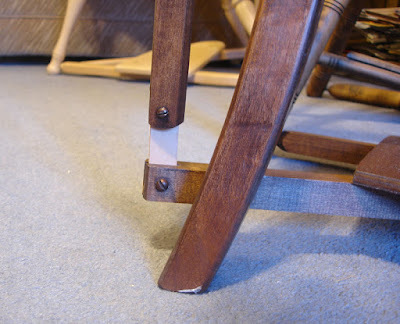 On inspection, the Haldane's joint is slightly wider than the Ashford type. It was quite tricky to dig out the bottom bit because it had broken off flush with the wood! Often they break where the screw has gone through. Fortunately, the type I keep does still fit and works a treat. This is the very old Ashford Traditional I'm rebuilding from a box of bits. The original owner did find some of the hardware, but I have had to buy some suitable screws and I'm still waiting on the right type of crank. Its treadle joint was in place but broken. Older Ashford wheels use a different type of joint, flat and made of leather. Fortunately still readily available. Note that the con-rod and treadle bar have slots rather than holes. With both types, be careful not to overtighten the screws, particularly with the flat type - it's possible to crack the wood. The reason they break where the screw goes through is because the screw cuts into the leather / plastic. Have you tried using a split pin? 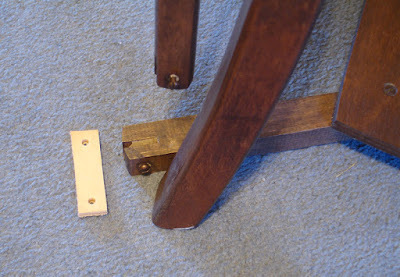 Split pins also have the advantage in that they won't crack the wood. Thanks for that tip - sounds ideal. I guess it would involve a bit of drilling as in most cases the screw doesn't go all the way through. A useful conversion.